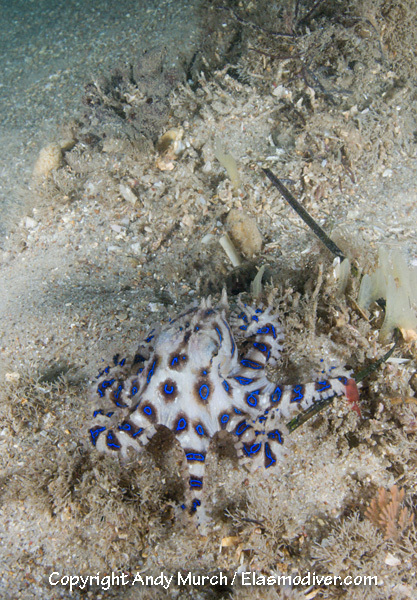 The greater blue ringed octopus (Hapalochlaena lunulata) is a wide ranging species of blue ringed octopuses that can be found around Australia and throughout much of the Indian Ocean. Divers should be extremely wary of the blue ring because it is an aggressive species that will bite when provoked. It has a powerful neurotoxin in its saliva that can be fatal. These Greater blue ringed octopus pictures are available for commercial licensing. For further information regarding usage please e-mail Elasmodiver. These greater blue ringed octopus pictures (aka Hapalochlaena lunulata) were taken in Nelson Bay, NSW, Australia. All of the octopus images on elasmodiver.com are copyright protected. 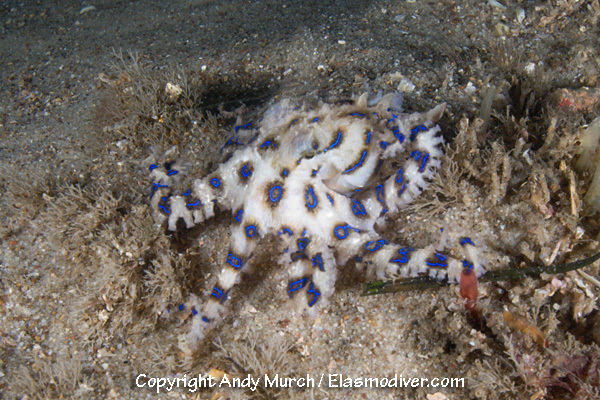 No unauthorized use of these greater blue ringed octopus pictures is permitted. Please contact Elasmodiver for further information.